Hand wash only. NEVER place cookware in an automatic dishwasher, or use abrasive cleaning pads or cleansers that can damage the pan and void the warranty. Interior: Clean the interior nonstick surface of the pan with a liquid dishwashing detergent such as Dawn and a non-abrasive sponge or soft bristle brush. 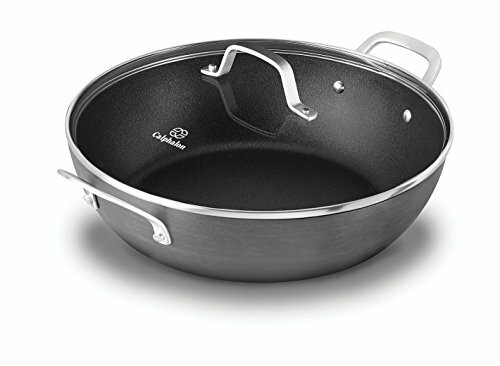 Exterior: Clean the hard-anodized exterior surface of the pan with a liquid dishwashing detergent such as Dawn and a non-abrasive sponge or soft bristle brush. For stubborn spots ON THE EXTERIOR ONLY, use Bar Keeper’s Friend cleanser and a non-abrasive sponge.